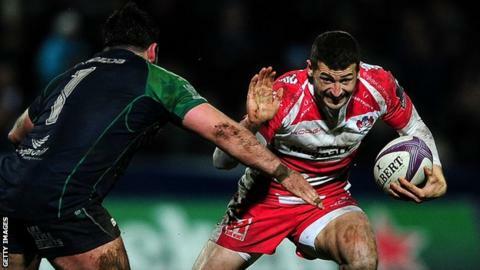 England and Gloucester winger Jonny May has said he is still low after being dropped during the Six Nations but that it can make him a better player. The 25-year-old was sent back by England after missing out on selection for February's 47-17 win over Italy. "There are highs and lows to rugby, this is a bit of a low," May told BBC Radio Gloucestershire. "For me personally I always learn more out of the downs and I will come away a better player." Exeter's Jack Nowell replaced May in Stuart Lancaster's squad and scored three tries over the matches against Scotland, Ireland and France. Chiseldon-born May has earned 13 caps for his country but was told by England's head coach that his inconsistency cost him a place in the side. "Stuart Lancaster said just go away and work hard," said May. "He said 'you are still in my thoughts; just get a bit more consistent'. "I made a few mistakes in a couple of those games and paid for it but that is international rugby. "Part of being an international rugby player is at times you are going to be dropped. It was not easy but I am determined to come out of it a better player and keep working hard." May, who has played 72 matches for Gloucester, said he was happy to return to his club and concentrate on his performances. And following their quarter-final European Challenge Cup victory over Connacht last week, May added that the side's focus is for more consistency ahead of their Premiership match away to Harlequins on Saturday. "The victory over Connacht keeps our season alive and what is more important is building on that performance," he said. "We have done it a lot this season where we have played a good game and then let ourselves down. "We need to make sure we back up what we did and build some continuity because that is going to be important for our confidence going into the semi-final the week after."